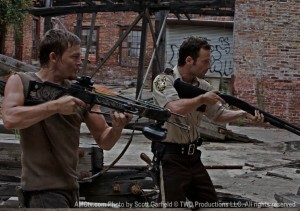 The Walking Dead on AMC! It ain’t just about zombies! One morning, you wake up in a hospital and wonder how long you have been there. You call for a nurse; you push the help button repeatedly and realize that no one is coming to your assistance. With sheer determination, you pull yourself up and slide your legs off of the bed. Your mind tells you that getting out of bed is the most logical thing to do. Your legs, however, disagree and you collapse to the floor with the feeling of pins and needles shooting through your entire nervous system. Something inside you trembles. There should be someone that had heard the crash that can come to your aid. You realize that all of the monitoring machines are off and the power is out, the only light you are given is pouring through the dirty Venetian blinds. You manage to lift yourself to your feet and make it into the hallway. What you witness is nothing short of surreal. 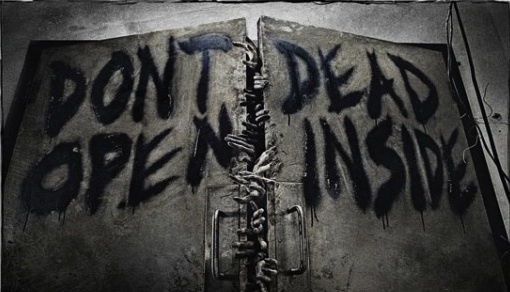 The hallway is empty and one of the sets of double doors has been chained shut with “DON’T OPEN DEAD INSIDE”. You stumble outside and see piles upon piles of rotting corpses. Holding back from vomiting with an empty stomach, you avert your eyes and shuffle forward. Out of your peripheral vision, something moves. You glance over in the hopes that it is someone who can tell you what is going on. Your jaw drops as one of the decaying bodies ambles towards you. Well thank your lucky stars you’re not Rick Grimes (Andrew Lincoln – Love Actually). Rick stirs from a coma only to find that Georgia has become a horrifying canvas of crawling carcasses. He begins a journey to find his family, praying every moment that they are still alive. Robert Kirkman’s graphic novel series, the Walking Dead, is much more than “just another zombie story”. It’s a study of the human condition. What happens when everything we have come to rely upon ceases to function? Instead of spending your evening sitting in front of the computer reading a blog or watching streaming video, you are sitting on top of an RV, keeping an eye out for Walkers with a shotgun at the ready. Your children grow up with a daily lesson in efficient ways to kill. “Family time” consists of hacking zombie face and burning the pieces. The only common denominator is the ever pressing desire to survive. When Rick comes across a caravan of survivors, they band together to keep each other safe. 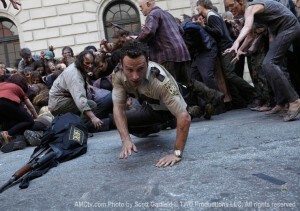 There is just as much safety in numbers of the living as there is destruction in a mass zombie attack. 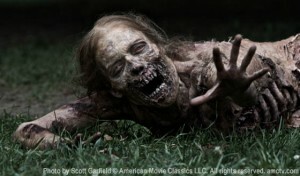 I am very much a fan of the graphic novels and cannot wait to see them come to life in The Walking Dead on AMC. My favorite character in the graphic novels is hands down Carl Grimes, Rick’s son. I cannot wait to see how eleven year old Chandler Riggs (The Wronged Man, Get Low) does. I do find it encouraging that executive producer Frank Darabont (The Shawshank Redemption) added a few new characters into the mix. Hopefully that means there will be 10 seasons revealing all of the characters back stories. Merle Dixon (Michael Rooker – Jumper, Slither) and Daryl Dixon (Norman Reedus – Meskada, Boondock Saints) have been referred to as a redneck ex-con and his equally dangerous brother. For more information on Rooker and Reedus in The Walking Dead, check out Eric Goldman’s post about speaking with Frank Darabont at Comic-Con back in July. 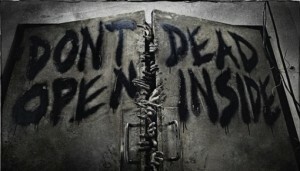 The Walking Dead will premiere on October 31st at 10/9c on AMC. To peep the four minute trailer aired at Comic-Con, visit the AMC Walking Dead page. AND if you are ever caught in a zombie apocalypse, save bullets for mass attacks! I’m pretty sure this is my favorite short film of the day.